Is Dolly Parton coming to Grace and Frankie? According to Zap2It, an appearance from the country star on the Netflix series is unlikely. 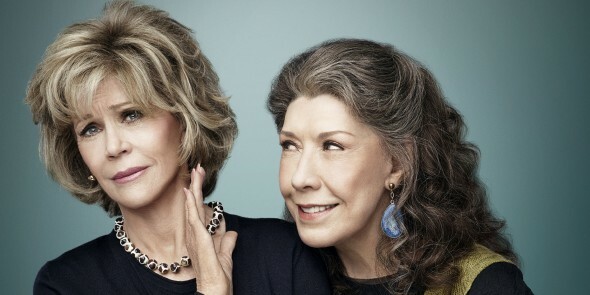 Grace and Frankie stars Lily Tomlin and Jane Fonda as two women whose husbands leave them for each other. Both Tomlin and Fonda starred alongside Parton in the 1980 film 9 to 5. Season two of Grace and Frankie was just released on May 6th. What do you think? Do you watch Grace and Frankie? Would like to see Parton guest star? What else would you like to see happen? I absolutely LOVE this show!!! I was hooked from the very first episode, binge watched for a week, and I just finished the last episode in season 2. Best show I’ve seen in years, for sure. The actors are wonderful and have great chemistry together, the writing is clever, and the story lines are intriguing. I’m very much looking forward to season 3. BRAVO! Best show ever. Jane a Lily are perfection. The rest of the cast is pretty darn awesome too. Although I’m sad now that I have just finished season 2. I plan to watch season 1 and 2 again with my mother. She will love it. Best show ever!!!! Can’t wait for season 3. Love the show! I just finished binge watching season 2, ready for season 3. Fantastic, one of the best–if not the best–new comedy in years. The jokes are fabulous. Laughing myself silly, but shedding tears as well. I loved 9 to 5! I’ve never seen Grace and Frankie, but I might watch it if Ms. Parton were a guest star. Love love love Grace and Frankie!